Venus glows in the center of this image from the evening of Thursday 29 July. To the top is Mars (left) and Saturn (right). Down below, just above the palm frond, is Mercury and just below the frond is Regulus. You definitely should click on the image to embiggen it. The sky has a lot more planetary high-jinks in store for us. Tomorrow night Mars and Saturn are at their closest, then Venus climbs highre for a sparkly rendezvous, while mercury becomes more prominent. The Last Quarter Moon is Tuesday August 3. Four of the 5 classic planets are visible together in the early evening sky. Venus is close to Mars and Saturn. Mars and Saturn are side by side. Mercury is prominent below these planets. Jupiter is now in the evening sky. Evening sky looking east as seen from Adelaide at 11:00 pm on Friday July 30 showing the Moon and Jupiter. Similar views will be seen elswhere at the equivalent local time. Click to embiggen. The Last Quarter Moon is Tuesday August 3. Jupiter rises before midnight, and can be readily see from about 11 pm local time, on Friday July 30 the waing Moon is close to Jupiter. 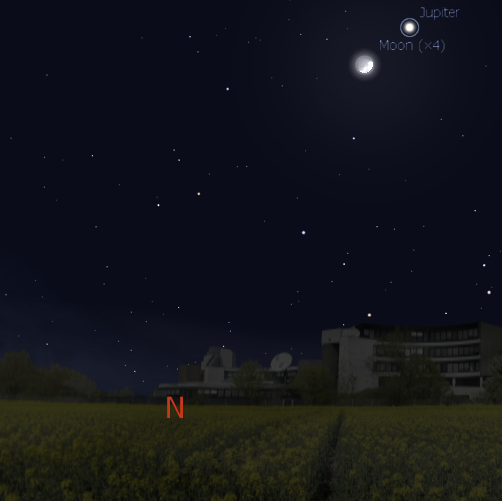 Jupiter is still clearly visible in the north-western sky as the brightest object in the early morning. Jupiter is now high enough in the morning sky for telescopic observation to be rewarding. Jupiter looks a little different now that one of its bands has disappeared. Jupiter and Uranus are close together and can be seen near each other in a pair of binoculars. Evening sky looking North-west showing Mercury,Venus, Mars, Saturn and Regulus at 7:00 pm local time on Saturday July 31. Click to embiggen. Mercury can be seen above the western horizon from half an hour after sunset at the beginning of the week. 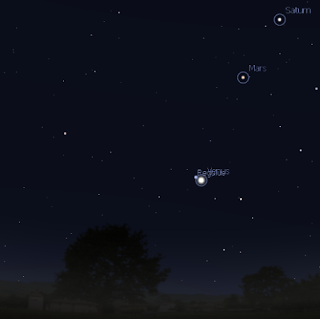 It is now quite easy to see, just above the bright star Regulus and below the massing of Venus, Mars and Saturn. Bright white Venus is readily visible above the western horizon from half an hour after Sunset, (even before) until past the end of twilight (about an hour and a half after sunset). Venus is in Leo the lion, not far from Mars and Saturn. During the week Venus comes closer to Mars and Saturn. On Saturday July 31 Venus, mars and Saturn form an attractive triangle. In the evening Mars can be seen low in the north-western sky. Mars is above Venus, close to Saturn at the beginning of the week. Mars and Saturn are side by side on Saturday 31 . Mars is now only slightly brighter than Regulus, but is distinguishable by its reddish colouring. Saturn is easily visible in the western evening sky as the bright yellow object close to red Mars. Telescopic observation of the ringed world is now difficult as Saturn sets earlier. Sundial found down some random street in Copenhagen. You really need to click to embiggen to see its full glory. Well, I'm back from WorldPharma 2010 in Copenhagen. As well of lots of interesting science (nuclear receptors can modulate Apolipoprotein expression and increase the rate of removal of amyloid form the brain, could be a treatment form Alzheimer's disease if it didn't cause fatty liver) but not so much astronomy. Partly because it was often cloudy at night and partly because, of course, it was summer, and at Copenhagen latitude the Sun didn't set till around 9:30 or so, and it was still light at 11. When I got up at 5:00, it was also fully light. So I didn't see much in the sky. But there was lots of astronomy related stuff around. 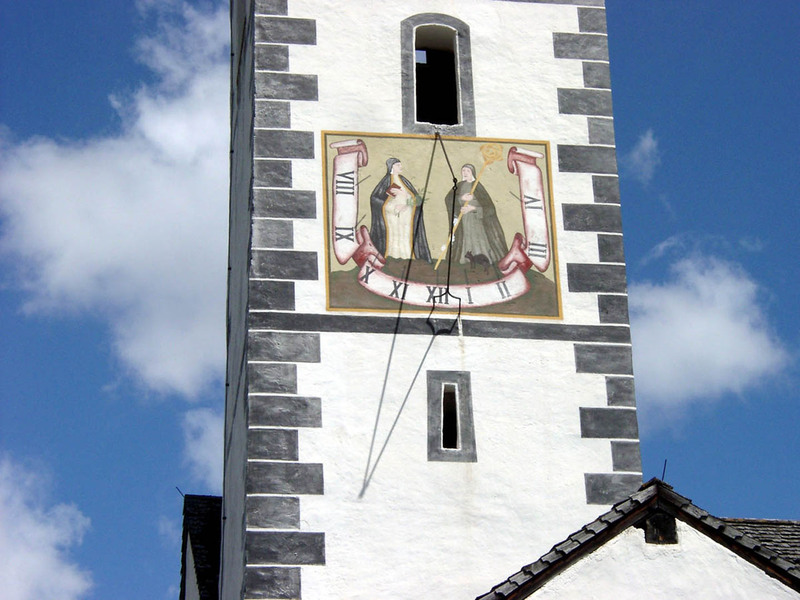 This sundial we found wandering around in random streets somewhere between Rosenberg Slot and the Rundturm (more about the Rundturm later). Copenhagen is a bit like that, turn some random corner and something amazing pops up. Anyway, we were actually looking at some amazing ivy covered buildings (and how the heck to get back to the metro) when we stumbled on this. At first we didn't know what to make of it. Was it a wall decoration? Was it a clock? The golden zodiac was pretty, but didn't seem to be related to anything. We first formed the hypothesis that it was a artistic clock and the comets moved to cover and uncover numbers, but that seemed silly. We came back later to see that the comets hadn't moved, and it was then that I spotted the gnommon. Yep, it was a sundial. I was confused by the numbers running from just 9 t0 4 (in the afternoon presumably), but other sundials have similar abbreviated faces, must have to do with when the sundial is exposed to the sun. I can't find it listed in any of the hertiage information in Copenhagen, maybe they just see it as being ordinary. The Full Moon is Monday July 26. 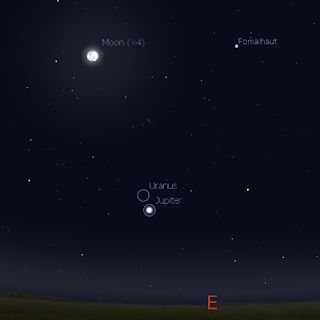 Four of the 5 classic planets are visible together in the early evening sky. Venus is close to Mars and Saturn. During the week Mercury becomes more prominent and comes close to Regulus. Mars and Saturn come closer. Jupiter is prominent in the morning sky. 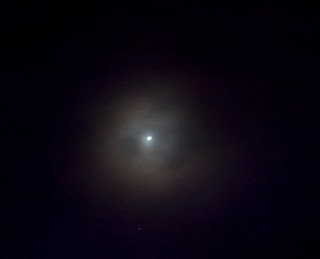 Evening sky looking east as seen from Adelaide at 11:30 pm on Thursday July 28 showing the Moon and Jupiter. Click to embiggen. The Full Moon is Monday July 26. 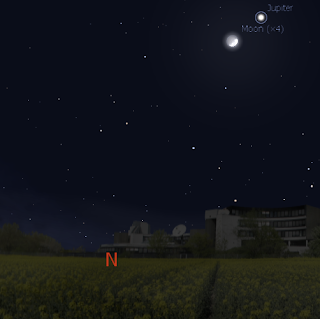 Jupiter rises before midnight, but is still clearly visible in the northern sky as the brightest object in the early morning. Jupiter is now high enough in the morning sky for telescopic observation to be rewarding. Jupiter looks a little different now that one of its bands has disappeared. Jupiter and Uranus are close together and can be seen near each other in a pair of binoculars. Evening sky looking North-west showing Mercury,Venus, Mars, Saturn and Regulus at 6:00 pm local time on Thursday July 28. Click to embiggen. Mercury can be seen above the western horizon from half an hour after sunset at the beginning of the week. It becomes easier to see during the week rising in the evening sky and coming closer to Regulus. On Wednesday July 27 Mercury is less than a fingerwidth from Regulus. Bright white Venus is readily visible above the western horizon from half an hour after Sunset, (even before) until past the end of twilight (about an hour and a half after sunset). Venus is in Leo the lion, not far from Mars and Saturn. During the week Venus comes closer to Mars and Saturn. In the evening Mars can be seen low in the north-western sky. Mars is to the right of Venus, close to Saturn at the beginning of the week. 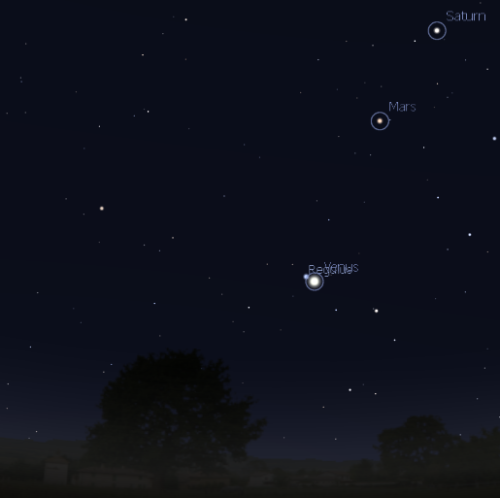 Mars comes closer to Saturn during the week and are nearly side by side by . Mars is now only slightly brighter than Regulus, but is distinguishable by its reddish colouring. Saturn is easily visible in the western evening sky as the bright yellow object close to red Mars. Telescopic observation of the ringed world is now difficult as Saturn sets earlier. On the 28th of July, Saturns' Moon Titan cruises just above the planets North pole. I'm currently at WorldPharma 2010 in Copenhagen, missing out on the wonderful events in our sky, but catching up on some amazing science. Thanks to the wonders of pre-scheduled posts, you will get the weekly sky and some other stuff while I'm away listening to the latest advances in pharmacological science. Copenhagen also hosted Tycho Brahe, and I've been coming across various astronomical tdibits that I will post about when I'm back in Australia, and can post photos. Anyway, off to catch some talks on drug modelling. See you all later. The fog room at the Australian Centre for the Moving Image. This lovely image of Wednesdays line-up was taken by Chris Wyatt, in Bendigo, central Victoria. Click to embiggen for the best effect. Tony Travaglia's beautiful shot of Wednesdays line-up as seen from Otago, New Zealand. He had good weather, lucky beggar. The shot focuses on the Moon, Regulus and Venus. You need to click to embiggen to get some wonderful detail. Shot with a Canon 400mm L series. The detail is quite astounding as the picture is 1/4 of the full frame. Tomorrow, Chris Wyatt's take on the night. 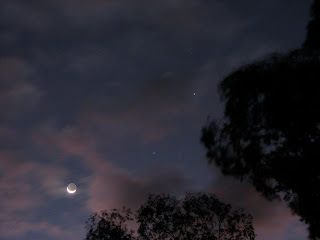 Left Panel, the Moon, Regulus, Venus, Mars and Saturn all line up on Wednesday July 14 2010. Right panel, close up of Moon, Regulus and Venus showing Earthshine. Click to embiggen (you will need to to see all the planets in the left hand image. Taken with my Canon IXUS ASA 400 2 seconds exposure, in between rain bursts. Carnival of Space #162 is here (and 161 as well). Carnival of Space #162 is now up at Skymania. There's much ado about eclipses, Rosetta at Lutetia, the skyview from Mars and much, much more. Rove on over and have a look. And umm, I also forgot Carnival of Space 161 at Habitat Intention. Well, I didn't forget it, but I was overwhelmed by work (marked over 160 exam papers) and family stuff so missed it completely. This is embarrassing, as not only is there a lot of cool stuff there, there was also a videoblog of the carnival, and my entry was first up (cringes). Sorry Aron! (now everyone go have a look). Red-Cyan stereo anaglyph of asteroid Lutetia created from ESA images. You will need red-cyan glasses to see the 3D effect. Around the same time Spain was beating the Netherlands in the World Cup, the comet chasing spacecraft Rosetta passed close by asteroid Lutetia. You can read the story and see some fantastic images at the ESA website, and you can download images from here. 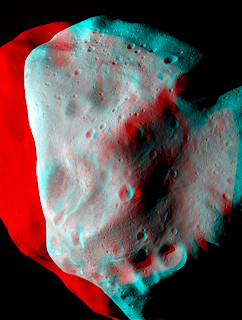 I made a 3D anaglyph from two consecutive images using the GIMP, they asteroid rotated too much for a good 3D effect, but you can still see the cental blug quite well. 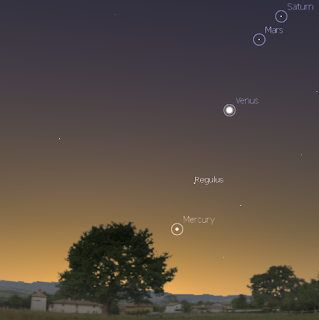 Evening sky looking North-west showing Mercury,Venus, Mars, Saturn and Regulus at 5:50 pm local time on Wednesday July 14. Click to embiggen. Over the next few days there will be a delightful series of massings of the Moon, Regulus, Mars and Saturn. Provided, unlike me, you have no rain clouds covering everything, you can see the thin crescent Moon form a line with Regulus, Venus, Mars and Saturn on Wednesday July 14, then on the 15th the Moon forms a triangle with Venus and Mars and on the 16t h it forms a triangle with Mars and Saturn. 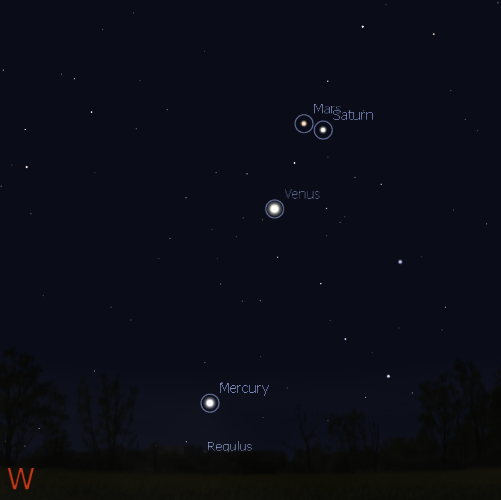 As well, if you are observing in the early evening, you can see fleet Mercury rise up frpm the horizon. The First Quarter Moon is Sunday July 18. 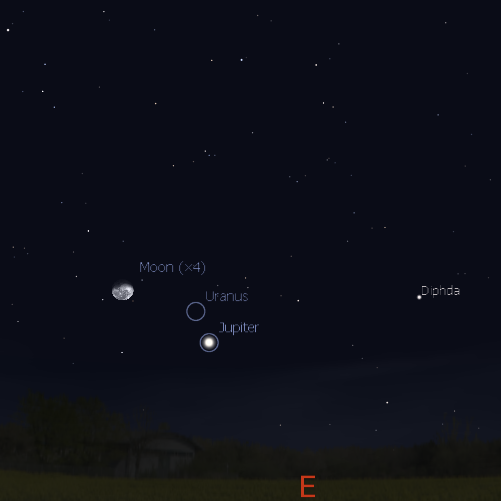 Four of the 5 classic planets are visible together in the early evening sky. Venus is close to Regulus. The crescent Moon, Mars and Saturn are close on the 16th, with Mercury below. During the week Mercury becomes more prominent and Mars and Saturn come closer. Jupiter is prominent in the morning sky. Evening sky looking north-west as seen from Adelaide at 5:50 pm on Friday July 16 showing the crescent Moon near Mars and Saturn. Click to embiggen. The First Quarter Moon is Sunday July 18. Jupiter rises before midnight, but is still clearly visible in the northern sky as the brightest object in the early morning. Jupiter is now high enough for telescopic observation to be rewarding. Jupiter looks a little different now that one of its bands has disappeared. Jupiter and Uranus are close together and can be seen near each other in a pair of binoculars. 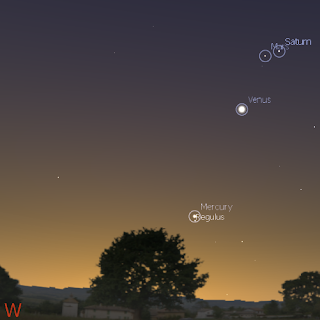 Evening sky looking North-west showing Mercury,Venus, Mars, Saturn and Regulus at 5:50 pm local time on Thursday July 22. Click to embiggen. Mercury can be seen low above the western horizon from half an hour after sunset at the beginning of the week. It becomes easier to see during the week rising in the evening sky and coming closer to Regulus. Bright white Venus is readily visible above the western horizon from half an hour after Sunset, (even before) until past the end of twilight (about an hour and a half after sunset). Venus is in Leo the lion, not far from Regulus, the brightest star in Leo, Mars and Saturn. During the week Venus comes closer to Mars and Saturn. In the evening Mars can be seen low in the north-western sky. Mars is to the right of Venus, close to Saturn at the beginning of the week. The crescent Moon, Mars and Saturn are close on the 16th, with Mercury below. Mars comes closer to Saturn during the week. Mars is now only slightly brighter than Regulus, but is distinguishable by its reddish colouring. Saturn is easily visible in the western evening sky as the bright yellow object close to red Mars. Telescopic observation of the ringed world is becoming more difficult as Saturn sets earlier. Saturn is high enough in the sky for the best telescopic views at around 7 pm. Saturn's' rings are opening, and look quite beautiful, even in a small telescope. On the 20th of July, Saturns' Moon Titan cruises just below the planets South pole. An iridium flare near Arcturus on July 5th. Not so bright, but very nice to watch. Evening sky looking north-west as seen from Adelaide at 7:00 pm on Saturday July 10. Click to embiggen. On the evening of Saturday July 10 Venus and the bright star Regulus (alpha Leonis) will be close, this is the start of a series of beautiful encounters in the evening sky of bright planets. Pop out and have a look. Venus, through cloud, once again sent by reader Tony Travaglia. Click to embiggen. Venus glows above the sunset in this mobile phone image taken on a bicycle ride on the week end. As usual I had to jam myself up against a pillar to stop the phone wobbling too uch. Click to embiggen. Tony Travaglia sends in this stunning image of the International Space Station crossing the sky as the moon rises. Click to embiggen, it's worth it. 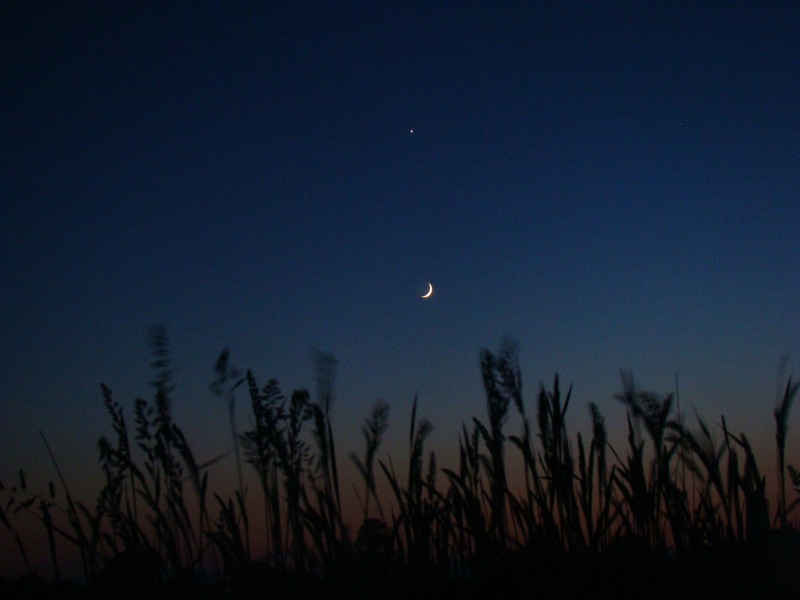 The New Moon is Monday July 12. 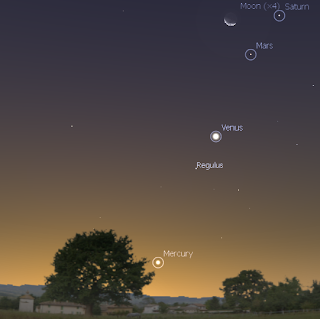 This week sees 4 of the 5 classic planets visible in the evening sky. Venus is close to Regulus on the 10 and 11th. Venus, Regulus and the thin crescent Moon are close on the 14th, with Mercury below. Venus the crescent moon and Mars make a nice lineup on the 15th with Saturn close by. Jupiter is prominent in the morning sky. The New Moon is Monday July 12. Mercury can be seen by the keen-eyed low above the western horizon half an hour after sunset at the beginning of the week, but becomes easier to see during the week. On the 13th the thin crescent Moon is near Mercury low in the west in the twilight. Bright white Venus is readily visible above the western horizon from half an hour after Sunset, (even before) until past the end of twilight (about an hour and a half after sunset). Venus is in Leo the lion, close to Regulus, the brightest star in Leo, Mars and Saturn. On the July 10th Venus and Regulus are closest at 1 degree (about a fingerwidth) apart. 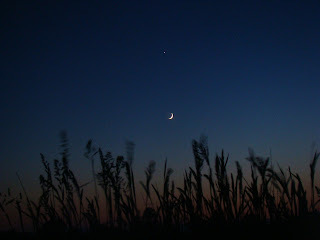 On Wednesday July 14 the crescent Moon, Venus and Regulus are close. On the next night, July 15, Venus, the crescent Moon and Mars form a shallow triangle. In the evening Mars can be seen low in the north-western sky. 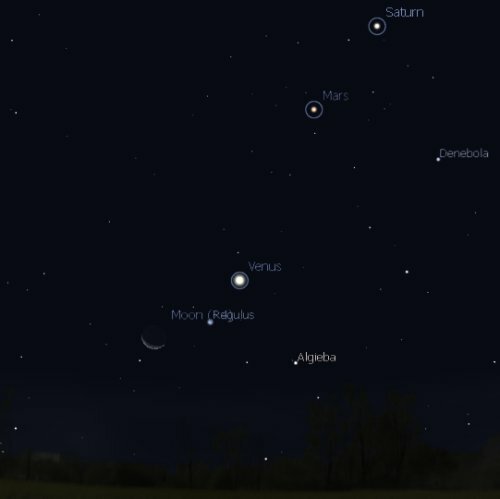 Mars is to the right of Regulus, midway between Regulus and Saturn at the beginning of the week. Mars comes closer to Saturn during the week. Mars is now only slightly brighter than Regulus, but is distinguishable by its reddish colouring. Saturn is easily visible in the western evening sky as the bright yellow object between the bright stars Regulus and Spica, just up from Mars. Telescopic observation of the ringed world is becoming more difficult as Saturn sets earlier. Saturn is high enough in the sky for the best telescopic views at around 7 pm. Saturn's' rings are opening, and look quite beautiful, even in a small telescope. On the 12th of July, Saturns' Moon Titan cruises just above the planets North pole. More Views of Venus and the Moon. 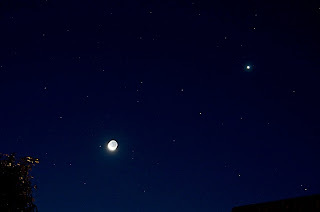 Venus and the Moon ride above the horizon in this image from Sherman Williams (c) copyright Sherman Williams. Click to the images to embiggen. 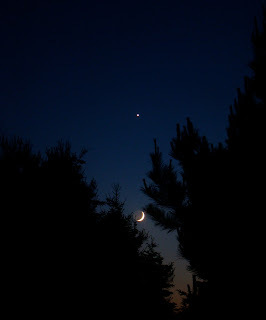 Remember when Venus was near the Moon back on June 16 (and June 15)? Reader Sherman Williams sent along these fantastic images of the Moon and Venus as seen that night from Nova Scotia in the northern hemisphere. His photos show how Venus and the crescent moon appeared in his sky, 45 deg N LAT, 64.23 deg W LONGITUDE at about 10 p.m. (UT -3h) Monday evening, June 14. They are fantastic (and yes, upside down from how we see them). Sorry to take so long to post them, but eclipse planning and exam marking diverted my attention from them. Enjoy! Carnival of Space #160 is here. Carnival of Space #160 is now up at Beyond Apollo. There's pink nebula, X-ray poems, panspermia and an extrasolar weather report. Buzz on over and have a read! Southern Skywatch July 2010 edition is now up! The evening sky facing north-west in Melbourne on July 14 at 7:00 pm AEST showing Venus and the crescent Moon, with Regulus, Mars and Saturn close by. (similar views will be seen from other cities at the equivalent local time eg 7:00 pm ACST Adelaide. The July edition of Southern Skywatch is now up with lots of planetary action, with Venus close to the Moon, Mars close to the Moon, Venus, Mars and Saturn forming interesting patters and Venus near Regulus. Jupiter is within binocular range of Uranus. Mercury returns to the evening sky. Jupiter is close to the waning Moon in the morning sky on Sunday, July 4. With Jupiter a handspan above the 57% illuminated Moon, you can use the Moon to locate Jupiter after the Sunrise. Jupiter and the Moon are also in a relatively dark part of the sky, so it will be easier to pick up after sunrise. If you start observing before sunrise the location of Jupiter above the Moon is obvious and you can follow the Moon and Jupiter as the sky brightens. If you are looking after sunrise (but before Moonset, around 11:30 am in Australia), first locate the Moon (fairly easy, as it is bright and in the north-west). Jupiter will be a handspan (the distance covered by your fingers when you hand is help up at arms length in at "stop" gesture, about 6 degrees) above the Moon, you may bneed to look carefully for a while before Jupiter "pops" out at you. Sometimes locating Jupiter in binoculars will help with locating it with the unaided eye. Make sure the Sun is hidden behind something solid like a building or a wall when you are looking for Jupiter, not trees or your hand. Exposing your eyes directly to the glare of the Sun can be very dangerous and you could potentially lose your sight. This is doubly true if you are using binoculars. You may remember how the British Chiropractic Association sued Simon Singh because he had the audacity to sepak the truth about Chiropractic. Now a medical testing firm, Doctors data, is suing Dr. Steve Barrett of Quackwatch, for criticising it. Well warranted and scientifically supported criticism. You can read more detail at Respectful Insolence. As with the Simon Singh case, pass the news on so we can raise awarness of this latest round of anti-science bullying, and you can contribute to Dr. Barrett's legal defense fund by donating to Quackwatch here. 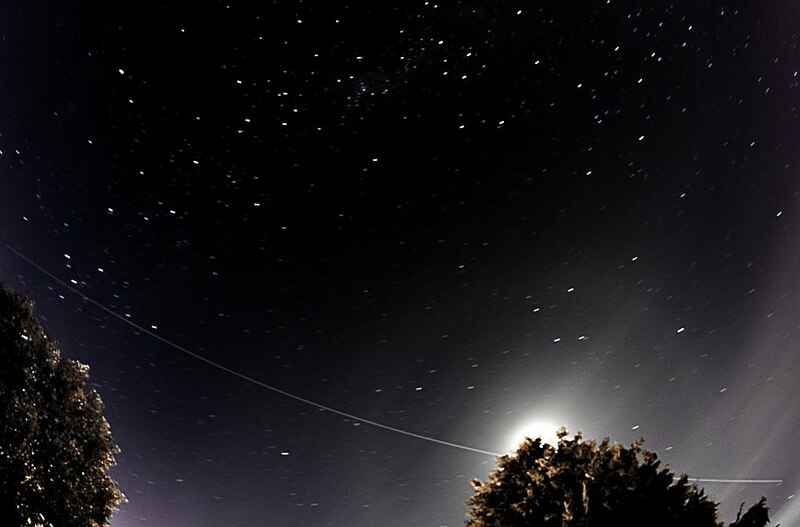 Iridium flares occur when sunlight catches the reflective antenna of the iridium satellites. They are pretty spectacular to observe, but, unlike the now bright International Space Station, the flares last a very short time. They are a challenge to spot, and a challenge to photograph. 1) Subscribe to CalSky's email Iridium flare alerts. I love Heavens Above, and they are my go-to page for all other satellites, but CalSky actualy gives you skymaps of where the flare will be. It means I don't have to download the TLE files for the iridium satellites in SkyMap and compare them to the Heavens Above time predictions. Iridium flare just missed in Adelaide passing below beta Centauri (you will need to click to see the faint, post flare trail). Canon IXUS 100 IS, 15 second exposure, 200 ASA. 2) Get a timepiece with accurate timing and seconds display. I use my bush-walking GPS, whose timing is corrected by the GPS satellites and which displays time down to seconds and has back lighting so I can see the time display in the dark. You really need this when a flare may last between 10-30 seconds. Your mobile phone will not cut it, neither will running in to your computer to check your hyper-accurate atomic clock adjusted computer clock. 3) Be really anally retentive about timing. I check the expected flare maximum time, subtract half my exposure time (15 seconds max to get the best trail, 1 5seonds is the longest exposure with the Canon IXUS) and the 2 second shutter opening delay (to avoid tripod shudder as I activate the shutter) so that I have bracketed the flare as well as possible. 4) Get out and set up well ahead of the flare, you can't rush out at the last minute and expect to set up in time. 5) Make sure you are pressing the right buttons. In the top image (with a decent flare shot), I accidentally pressed the "off" button next to the shutter button, so the camera turned off and all my settings evaporated. Luckily I was able to get most of the flare with a hasty turn-on and reset. 6) Don't talk to your mother on your mobile while waiting for a flare, you will be distracted and press the button at the wrong time. The lower image shows the result of that. Just follow these simple rules and you can catch iridium flares. Mostly ... well sometimes. So long as your mother doesn't call.